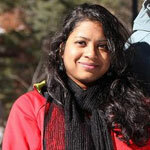 Sandhya Nadipalli currently serves as Research Associate and Database Administrator for NTC and BOND projects. She earned her Masters Degree in Computer Science in 2006 from George Mason University. Before joining RRTC, she worked for multiple corporate offices as a database administrator and web developer. Along with managing NTC website and data, Sandhya is also involved in Employment Success Advisor Planning program. She is well trained as an administrator in managing ETO Software from Social Solutions and takes care of the issues and adhoc report generation tasks involved in the process. Sandhya also worked on analyzing Work Incentives Connection, Goodwill/Easter Seals Minnesota data which involves running yearly statistical analysis reports, creating state level charts using Photoshop and Illustrator to represent the data.